The folks from bit-tech have done us a great service by tearing open the Eee PC 901. Under the keyboard is a large metal plate that acts as the processor’s heat sink. The 4GB SSD card is not soldered to the board this time around. There is some empty space labeled IDE3 and solder points that say 3GCard, which definitely deserve further investigation. The oddest thing they found was a button with no indication to its purpose. 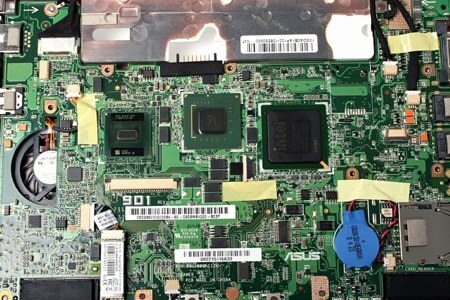 It looks like a good machine and we hope to see more Eee PC hacks in the future.